With my work, I question general assumptions and investigate universal aspects in relation to human existence and our (in)comprehension about it. After graduating in the directions of painting, drawing and graphic art, I soon felt the need to work outside framed borders by creating (interactive) installations and environments, using photography and video. Moving through space and time I integrate day to day life and utilise found objects or moments, concentrating on details and systems within. Internet is part of the journey. I believe in diversity and xenogamy. The media I use are related to interactions I seek with my surrounding and activities that I'm engaging in. Everything we know is interconnected yet not always perceived as such. On the one hand I like to keep some distance between individual works, let them be what they are within their own 'constellation'. On the other hand I want to emphasise on relationship. 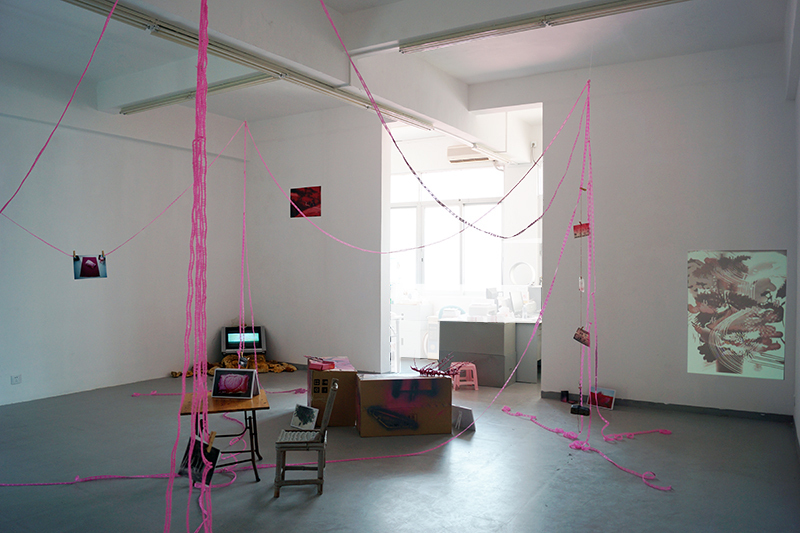 Therefor the work is developed towards situations of multiplicity, sometimes as (total) installations or environments. The space between a collection of individually shaped forms, necessary to be recognised as separate objects and the space they take up as a total, including the necessary space around them to experience them as a united whole, defines the shape of the platform they are presented in. Deconstruction is a way to understand.